LiveCode LessonsLiveCode LessonsHow To - Step-By-Step Guides To Tasks In LiveCode LiveCode ArraysHow do I store an array in a text file and then retrieve it again? LiveCode enables you to convert an array into a format that can be stored in a file or sent to a URL using arrayEncode. 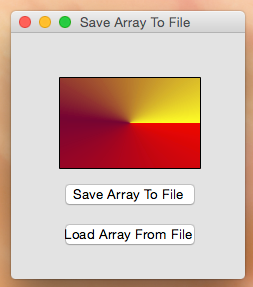 Conversely, you can use arrayDecode to to convert data back into a LiveCode array. This lesson will show you an example of how to use arrayEncode/arrayDecode with the fillGradient property of a graphic. In LiveCode the fillgradient property of a graphic is an array containing all of the gradient information. The example stack demonstrates how to store the fillgradient array of the graphic in a file as well as load the fillgradient array from a file and assign it to the graphic. This code snippet from the example stack demonstrates how to convert the fillGradient property (an array) of a graphic into a binary representation of the array using arrayEncode. This binary representation is stored in the variable theEncodedArray. When storing the array in a file it is important that you write the data to the file in binary format otherwise the encoded array data will be corrupted. That is why the binfile: prefix is used. To load the binary representation of the array from a file you just reverse the steps. Begin by reading the data from the file in binary format using the binfile: prefix. In this snippet the binary data is stored in the variable theEncodedArray. You can then pass the binary data to arrayDecode which transforms the binary data back into a LiveCode array variable, theFillGradientA in this case. At this point the array can be assigned to the fillgradient property of a graphic. ask file "Save fillGradient array to file:"
answer file "Select file containing fillGradient array:"
Prev: How do I rename a key in an array? Next: How do I Search an Array? Nice. But to save as a TEXT file, you must base64Encode the encoded BINARY data. To load it, just base64Decode. Note that the example given uses "binfile". That takes care of binary just fine. Altho your solution works as well as the example, yours will generate much bigger files.